Join the discussion on our forums! Come discuss Duskbreaker over in our dedicated Duskbreaker discussion topic. This should probably be a 2/2 with a 2 damage AOE: as-is it's like a better Hellfire with a free 3/3 body. This this shi* is programed to be at the bottom of my deck. Completely agree. Warlock spell Hellfire does roughly the same thing for the same mana, but without the 3/3 body and with the downside of damaging your own hero. 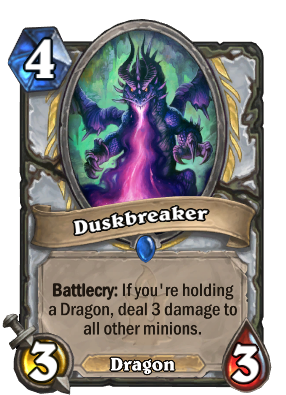 Sure, the Priest needs a dragon in-hand, but that's very easy to accomplish and does nothing to offset the OP nature of this card. play around it and use deathrattle minions or those with high health. yeah, hunter's have so much of these, right? just being real here, Duskbreaker kill's 90% of the existing low mana minions, and the other 10% aren't good enough to use in a agressive/midrange deck (excluding archetypes like Play Dead hunter). This card is straight up broken, playing it turn 4/5 agains't any agressive deck win's you the game. Maybe play good decks that are strong in the meta? Don’t play bad decks that lose all the time. it is so satisfying to clear voidwalkers with this. Dragon priest is the cure for cancerlock. i hate how people argue this card is not broken because it's weak against control. But come on a 4 drop 3/3 body with hellfire AOE clear like wtf is wrong with this game. Getting wiped was already bad and have to deal with a 3/3 body? This card is op, won so many games with it. Half the time i get an extra one from netherspite historian, many times I get 2 extra from netherspite. In late game against cubelock, it just clears all the voidwalkers like nothing, wins the game ez. Its an auto include in any priest deck pretty much.